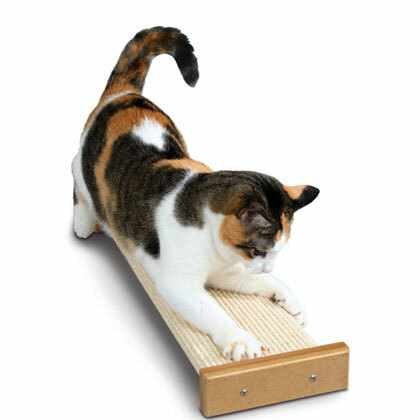 What is SmartCat Bootsie's Combination Cat Scratcher? Cats love to scratch and "knead" fibrous surfaces. It helps relieve stress, tone muscles, and remove old nail sheaths from claws. However, when furniture turns into a scratch pad we may not be so happy. That's why the SmartCat Bootsie's Combination Cat Scratcher is so helpful! With durable, sisal material for scratching, a wall mount and rubber feet to stop slipping, the SmartCat Bootsie's Combination Cat Scratcher fits almost anywhere in your home and stops your cat from ruining your furniture. The SmartCat Bootsie's Combination Cat Scratcher helps your cat relieve stress, removes old nail sheaths, and helps to tone muscles. The SmartCat Bootsie's Combination Cat Scratcher also stops your cat from wanting to scratch and knead on your furniture. The SmartCat Bootsie's Combination Cat Scratcher can be mounted to the wall or it can just sit directly on the floor. You don't have to worry about the SmartCat Bootsie's Combination Cat Scratcher slipping around on the floor because it has rubber feet. Place or mount the scratcher in a room where your cat spends a lot of time. If there is a spot your cat has already been scratching, place the scratcher in front of it. To introduce the scratcher to your cat try using catnip as a lure. After your cat begins to scratch the sisal material make sure to give praise and a food treat. You can also try scratching your nails along the surface of the material to teach your cat where to scratch. 2.5" x 7" x 24"